ABOUT THIS PROJECT: In 2009 I read the work of Ramon Pujades "Les cartes portolanes: la representació medieval d'una mar solcada"*, which pointed me to a body of knowledge regarding the map-makers of Majorca of the late middle ages that had not obtained the recognition it deserves in the English-speaking cartographical research world. This body of knowledge includes the work of Jaume Riera and Father Gabriel Llompart. I knew Father Llompart from my school days in Majorca when I attended Colegio San Cayetano, the community where he still resides. In the summer of 2009, I visited Father Llompart and proposed to translate his and Riera's research into English. He agreed and contacted Jaume Riera, Secretary of the Archival of the Kingdom of Aragon at Barcelona, who also agreed to this enterprise. The Cresques Project was born. This webpage was created to make their significant contributions to the history of cartography available in English and to promote medieval Mediterranean cartography in general. I am indebted to both the late Father Llompart and Jaume Riera for their help throughout this project. I am also grateful to Mr. Bill Warren (California Map Society) and Mr. Tony Campbell (former Map Librarian of the British Library) for their encouragement to pursue this project. I am indebted to The Huntington Library and its staff, in particular, Laura Stalker (Avery Associate Director), for granting me access to the Huntington's rich reference material. Finally, my gratitude and love to my wife Kristin who patiently proofread all the works. *In Catalan, with English text 'Portolan charts: the medieval representation of a ploughed sea', Barcelona: Institut Cartogràfic de Catalunya; Institut d'Estudis Catalans; Institut Europeu de la Mediterrània; Lunwerg, 2007. [With a DVD featuring the charts and selections of the atlases cited.] ISBN: 10: 8497854144. 13: 9 788497854146. 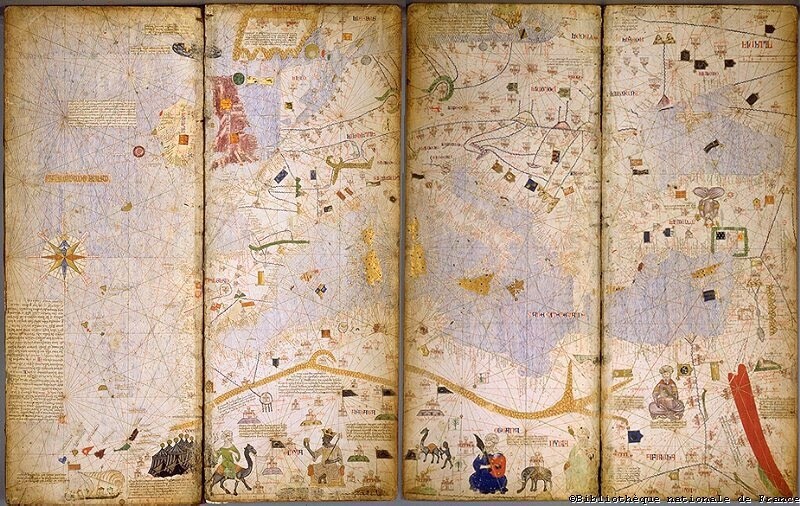 Picture above centered: The Catalan Atlas of 1375, attributed to Cresques Abraham. Picture above left: Juan Ceva on the left, with Father Gabriel Llompart, Mallorca 2009.